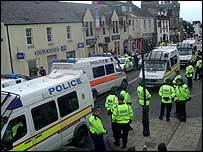 People in Auchterarder woke on the second day of the G8 summit determined to carry on life as normal. 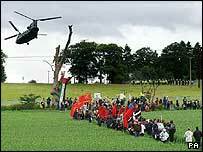 Few protesters were left in the village, which had also seen a dramatic reduction in police presence by lunchtime. "It's like Sleepy Hollow," one journalist remarked to me as we walked along the length of the High Street looking for signs of life. A Japanese couple approached us. "Where's the demonstration?" asked one, looking perplexed. Apparently they had got their dates mixed up and should have arrived on Wednesday. Even so, they were surprised that a strong protest presence had not been maintained less than 24 hours later. One resident remarked that the village he had lived in for the past 30 years now seemed even quieter than usual. He said: "A lot of people went on holiday because they were scared to be here when the march took place. "Now the marchers are gone and a large part of the village is elsewhere too. It's a little eerie to be honest." 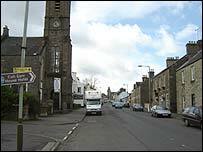 Those left in Auchterarder admitted to breathing a huge sigh of relief the morning after the night before. "A wee spot of bother" is how one lady described the confrontation between a small percentage of the marchers and police at the security fence on Wednesday. And she was hopeful that shops which had closed, or had boarded up their windows in the days leading up to the nearby G8 summit, would remove the extra protection and reopen. It was, she pointed out, the only sign that something out of the ordinary had happened in Auchterarder. On Wednesday, the main thoroughfare through the village was awash with police vans, officers on foot and colleagues on horseback. Large numbers of demonstrators headed towards a rally in the village park and fun was had between locals and various members of the ever popular Clown Army. A day on and the few people spotted in the same street were either residents continuing with daily life, or remaining journalists trying to find something to write about. Police too were few and far between, with traffic wardens seemingly the busier of the two. Security patrols were stepped up as news filtered through of events in London, but on the whole the village had seemingly breathed a collective sigh of relief. A local businesswoman went so far as to describe Wednesday - a day she admitted to having approached with apprehension and fear - as "brilliant". She said: "Everyone I met was very friendly and would be welcome back here again. I'm proud they were able to protest here and proud of their behaviour. "It was a day that people in Auchterarder will never forget and I very much hope they won't forget Auchterarder either." The Gleneagles summit may still have a day to run, but with life very near to normal again for many local people, it might as well already be over.